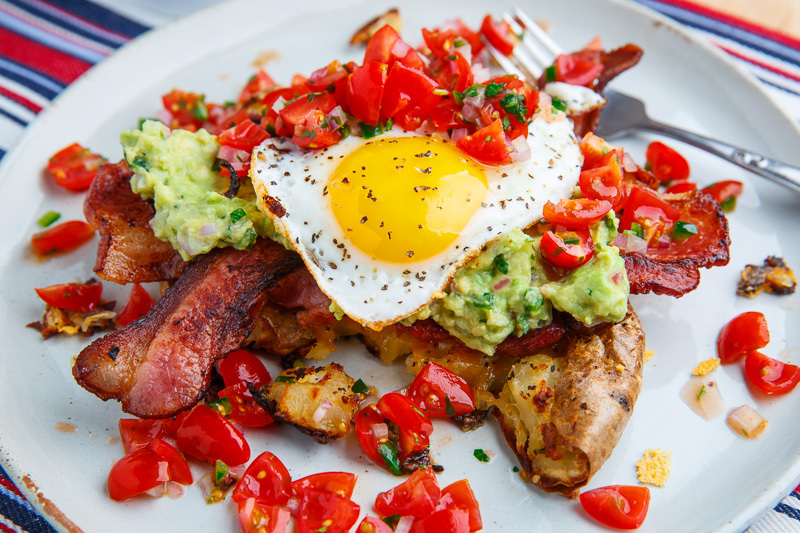 A crispy smashed potato served topped with melted cheese, cool and creamy guacamole, crispy bacon, a fried egg with a runny yolk and a fresh tomato salsa! 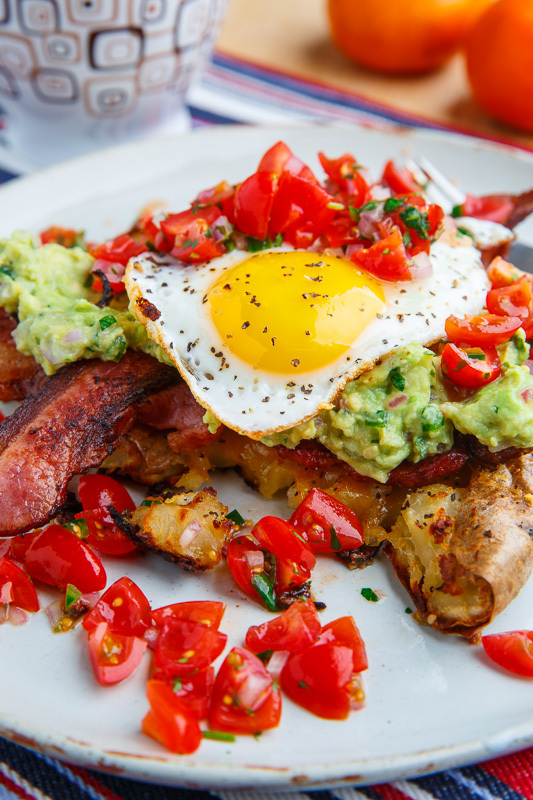 Tomorrow is Cinco de May and these crispy smashed potato pancakes with guacamole, pico de gallo, bacon and eggs are a great way to kick off the celebrations! The idea here is that you take some cooked potatoes and smash them down into pancake like discs, brush them with oil and bake them until the are nice and golden brown, crispy and all sorts of good! 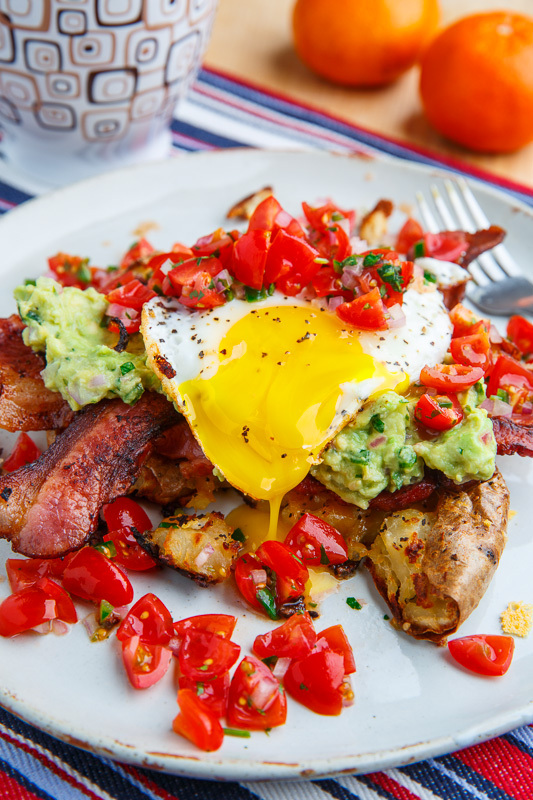 I give them a “Mexican” kick by topping them with plenty of melted cheddar cheese, guacamole, crispy bacon, a fried egg with a runny yolk and finally a fresh tomato salsa, aka pico de gallo! 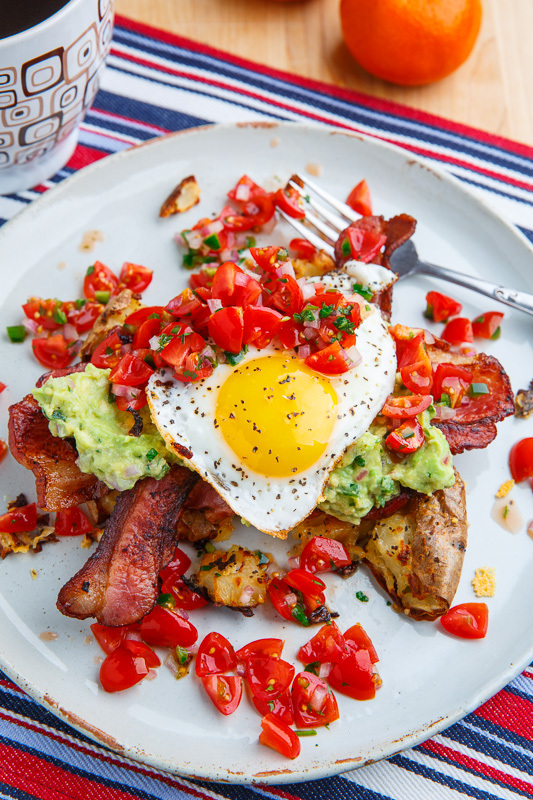 There are just so many amazing flavours going on in these crispy smashed potato pancakes with guacamole, pico de gallo, bacon and eggs which are great for breakfast lunch or dinner! Bake the potatoes on a baking sheet in a preheated 425F/220C oven until just tender, about 40-60 minutes. Brush the potatoes with oil, season with salt and pepper and bake them on the top shelf of a preheated 450F/230C oven until golden brown and crispy on top, about 20 minutes. Sprinkle the cheese on the potatoes and bake until melted, about 5 minutes. Cook the eggs as desires. 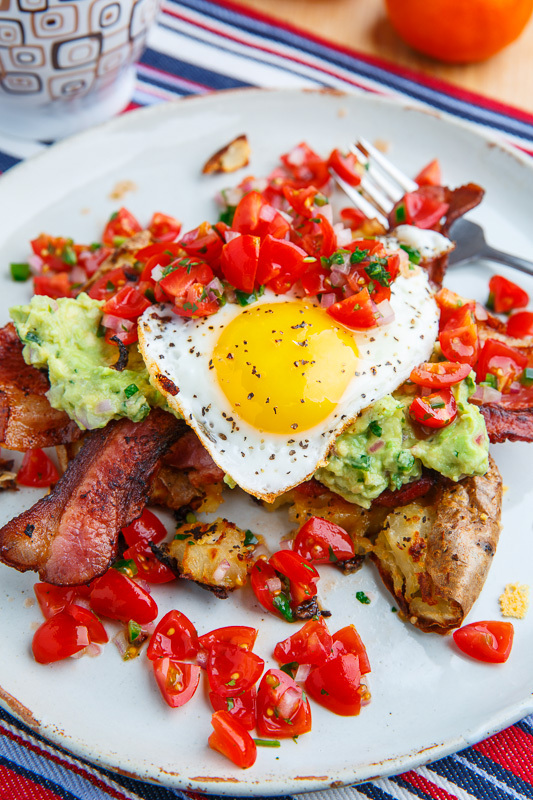 Plate the crispy smashed potatoes, top with the guacamole, fried egg and pico de gallo and enjoy! Tip: Bake the potatoes and make the guacamole and pico de gallo the night before and/or make the guacamole and pico de gallo while the potatoes are baking. Option: Use your favourite taco style condiments like salsa, sour cream, pickled jalapenos, etc. This looks like a dreamy breakfast! Now this looks like a breakfast that would even satisfy my hungry boys! Love the smashed taters!!! They look amazing! At what point do you smash the potatoes? What is the best way to smash? Oh, Kevin…you are killing me!!! I ditch any diet for this one!